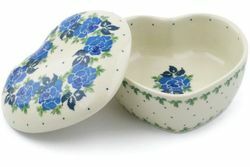 Polish Pottery Pottery Covered Heart Box- beautifully hand crafted in Poland, these small stoneware boxes are as practical as they are beautiful. Use it to store jewelry, to hold potpourri and candy. Boleslawiec pottery is painted by hand by talented artisans at famous Ceramika Artystyczna factory, so no two pieces are identical. These jars make a pretty, practical addition to your polish pottery collection.